Tough guys. Football players, rugby players, soccer champs, golfers, runners and more are often seen taking Pilates to stay in shape during the off season or to increase flexibility, core strength and balance. So don’t be surprised if the person next to you in class is six foot six, tips the scale at twice your weight, and sports some facial hair! People who are “out of shape”. Far from being a cop-out, Pilates is actually safer and more effective than many forms of exercise if they are not in the habit of exercising and want to start. They can move at their own pace and quickly ramp up. Aging people can derive great benefit from Pilates as a safe workout that increases strength, maintains flexibility and balance, and keeps them feeling and looking younger. Disabled veterans or others with injuries. One of the original purposes of Pilates was to help soldiers who were wounded get rehabilitated. Pilates has also been proven to be an excellent workout for people with back injuries or other problems. Many Pilates centers now offer mixed classes so parents and children can work alongside each other. This is a fantastic way to learn discipline, support growing bodies, and accentuate training for other activities such as sports. Pilates was also originally a common activity for ballet dancers of both sexes. Barre Pilates is making a big splash currently and most Pilates studios now include barre Pilates in their offerings. This should clear up any misconceptions about who Pilates is for – obviously, it’s a great workout regimen for just about anyone! Welcome them all into your space and enjoy learning with them as you continue your own Pilates journey. The art of Pilates attracts people from all walks of life, all ages, and both genders. It’s a core workout that enhances not only strength and fitness, but flexibility, agility, grace and balance. Pilates can be done at home, in a studio, out of doors, and even at one’s desk! How do you choose between doing Pilates at home, or in the studio on the mat, on a Reformer machine, or at the Barre? Different methods work best for different people – but overall a combination is the best way to take advantage of the maximum benefits Pilates has to offer! Pilates at home lets you maintain your workout 7 days a week, rain or shine; you don’t have to battle traffic, sacrifice time spent on the commute, and so on. But only doing Pilates at home can make you miss out on many benefits you can only get in a studio setting! One on one interaction with trained, talented Pilates instructors who can pinpoint the areas you are missing in your workout, and correct any mistakes in your form or method. Access to the equipment required for full on Pilates work; no matter how strenuous your mat workout, you simply can’t achieve the same results when you limit yourself to floor work. 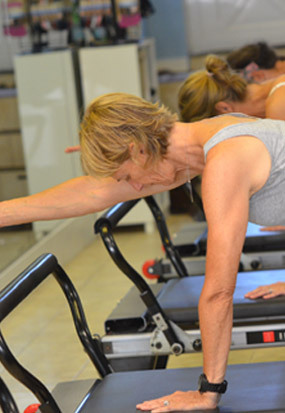 A Reformer can provide extra resistance and stretch muscles you’ll miss working out on the mat. Opportunities to participate in extra activities, such as Barre Pilates, which requires special instruction plus a ballet barre and mirrors to work out properly. The motivation to give your best in each and every workout. It’s easy to slack off at home, cutting corners and missing out on the full benefits of Pilates. When you work in studio, you are kept honest and can progress much more quickly as you push yourself to achieve! Support of friends as you advance in the art of Pilates. When you work out alone, you don’t get that same feeling of accomplishment and companionship you can experience at the studio among people striving just as hard as you are. Working out with a buddy or group also helps keep you honest! Working out at home with a Pilates video and your mat is a terrific way to stay involved on days that you don’t have studio sessions, but it’s never a substitute for a full Pilates workout! Check out our multi-session packages and monthly unlimited package, and recommit to in studio Pilates today! Pilates and Kids – Why Don’t More Children do Pilates? Pilates is becoming more and more popular with men as well as women – but what many don’t realize is that it’s an ideal workout for kids as well. Children pick up on body image concerns by watching others. We can counteract body image issues by starting kids early on simple exercise routines that they can continue with and feel good about whether they turn out to love sports or are bookish by nature! Children are more flexible than adults, but as we age we lose much of that flexibility. Getting started on Pilates when young instills a habit that can help the individual retain flexibility much later in life. Extra flexibility also means less chance of serious injury and faster healing time if an injury does occur. Even as young children, we start patterning our behavior and falling into habits as regards our posture and coordination. Bad habits can lead to muscle and joint pain and even bad back problems. For kids with scoliosis, this can be even more likely. Pilates includes correct movement patterns, promotes good posture, and can be used to teach children how to move gracefully and efficiently without causing strain to joints or muscle groups. Kids with inner ear issues can also benefit from the balance that Pilates teaches. Kids who are all over the place often calm and become focused when given an intense workout to do. Being allowed to move their bodies in controlled ways allows them to relax and then turn that focus towards academic subjects. Split up your child’s day with alternating physical and brain centered activities, and use Pilates to teach them self-control and concentration. Finally, Pilates can be a fun way for the entire family to spend time together and make a stronger familial bond. Everyone can work at their own pace, and use their own style – floor and mat Pilates, barre Pilates, equipment based Pilates, Pilates using an exercise ball, and more. Sign your family – kids included! – up today and find out how Pilates can benefit every person in the home. When people think of Pilates, it’s often in association with women, dancers, and others who have made the fitness regimen mainstream. However, there are several programs out there that focus on the original use of Pilates – as a rehabilitation treatment for wounded veterans of World War I. You probably know the name “Joseph Pilates” as the founder of the titular workout routine. However, not all people know that when Joseph developed his now popular regimen, he was in an internment camp in Great Britain as a German citizen. Rather than be bitter about his experience during the war torn years, Joseph worked diligently as a fitness teacher and nurse. During his time in internment, he developed and refined his methods, calling his system “Contrology”. As wounded soldiers arrived from battle lines, he applied his methods to strengthening and reconditioning them. Today, many projects exist which use Pilates to help veterans with injuries – including many who suffered amputation of one or more limbs. Pilates focuses on strengthening the core, and a few years ago the Royal Danish Ballet stepped up to partner with injured soldiers from Afghanistan to offer rehabilitative Pilates. The idea quickly gained steam, and now many projects for “Wounded Warriors” exist, bringing Pilates full circle and emphasizing its value to those who require a steady, safe, and effective method for restoring flexibility, range of motion, balance, and inner core strength. Pilates is a terrific way to work out. It’s provides great training for athletes in all types of sports and activities, from dancers to tennis players to football stars. It can be a terrific family routine, a couple’s way to spend time together while working out at their own pace, and even an option for seniors who need an exercise regimen to strengthen aging bones and joints. However Pilates was originally developed as a way to help veterans of wars, to rehabilitate their bodies and help them adapt. Today, with soldiers in many countries returning home to a different life than the one they had before, Pilates can provide a way to make that life richer and more mobile.